It's a fun car to drive! Interests:Cars, Travel, Track Days, F1, Tennis. Exhaust world in north Melbourne cost me $110 for a 30 minute job, I've heard of people getting it done for cheaper but it came down to convenience for me. Welcome. Great car in the best colour! Interests:bikes ( until a recent BAD accident), now cars! I just need to be patient and wait for a seller who is like me.....ie gives things away! JP, looked at both and decided I needed the six speed, the five speed in the Fiat is just not long enough. Ta. I only need a car occassionally and really just around the city, hence I thoght of the Abarth. 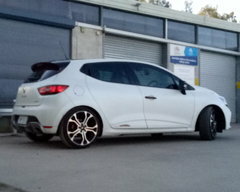 Mind you, I dont think the Clio is much bigger.